The temperature in San Francisco and all of Northern California these first days of October has felt much more like a mid-western summer than our fall. Although October is often our sunniest and most beautiful time of the year, hitting 90° on the thermostat is pushing it just a little bit out of my range of being comfortable. I have always found fall to be a rather comforting time of the year. There’s a great burst of color just before the trees go naked for their winter sleep. The local color palette is not quite as vibrant as I remember seeing in the rolling hills and mountains of the Adirondacks or New England, but there are still many hints of the beautiful hues of autumn. My favorite fall colors are orange, yellow and white. These are manifest best among the aspen trees of the Eastern Sierras. When a cold snap sets in and the chlorophyll stops flowing, the leaves of the green Aspen cease their photosynthesis and reveal hues of bright yellow, orange and sometimes red. As the leaves begin to fall to the ground, the Aspen trunks show off their beautiful white lines dancing among the colors. But the beautiful autumn colors of orange, yellow and white are ever before me. When I’m in the market or at the counter of the local store there the colors are — in the candy corn. People like me who have a sweet tooth often greet a new season with joyful anticipation of the treats that surround the seasonal festivals. 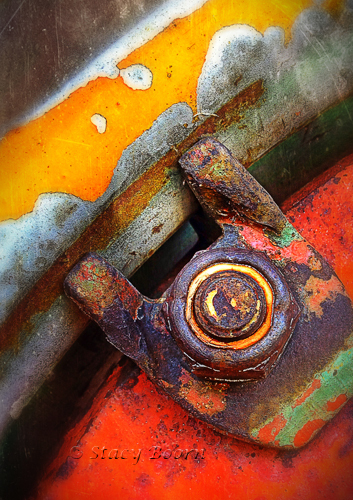 But I am seeing orange, yellow and white even on the rusting rims of old tractors. Although we know when fall is going to arrive and we can trace the patterns of certain foliage locations, there is still some unpredictability as to how the fall foliage will present itself. You don’t actually know what you’re going to get at any location until you get there. On previous trips to the Eastern Sierras, driving I-395 from Bridgeport to Bishop, I made notes. The Aspen trees around Lake Sabrina near Bishop, at about 8000 feet, turned colors two or three weeks before the Mono County groves. So last week I rushed over for a couple of days. I was surprised by the beauty I saw. 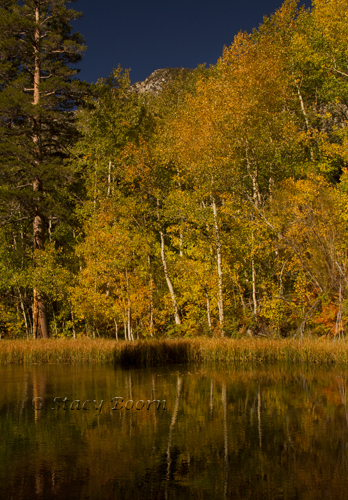 I had only been there in previous years well after the colors at Lake Sabrina had peaked. Fall is also a time when we see in the cascading foliage a symbol of the importance of letting go of things, even some things that have been most important to us. It is also a reminder that we don’t need to hold on to everything in order to make it through the upcoming darkness of the long nights and even through the winters of our soul. 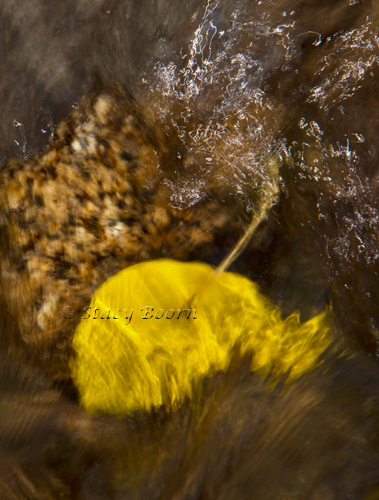 Images: Lake Sabrina Area, Tractor Rim Detail, Leaf in Stream. This entry was posted in Weekly 2 and tagged Aspen, Aspen Leaf, Bishop CA, Eastern Sierra, I-395, Lake Sabrina, rust, Stacy Boorn, Stream Photo, Tractor Rim Rust. Bookmark the permalink.